Many of the Graduate Programs associated with the G51 Venture Scholars recognize this program as a course credit in their MBA or Entrepreneurship programs. Work side-by-side with experienced business leaders, technologists, and mentors who spend time teaching, coaching, and mentoring you. Our Research is strategically used by some of the country’s most innovative companies, and your work is a great way to gain access to these hiring managers. What is the G51 Venture Scholars Program? Each Venture Scholar will review business plans, partake in Shark Reviews, and share opinions with G51 Partners. Participate in person or via video conferencing. Venture Scholars will communicate and work with entrepreneurs, helping to facilitate dialog between the entrepreneurs and G51. 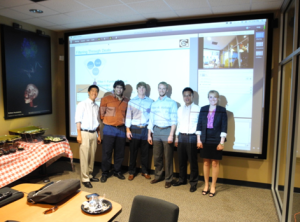 When possible, Venture Scholars will attend the entrepreneur’s pitch at G51 headquarters or remotely. Venture Scholars may have the opportunity to source and work with companies. Venture Scholars may assist with various real world business problems for G51 and/or select startup companies. Current position: Vice President – Investment Management at Goldman, Sachs & Co.
Any G51 Intern or Venture Scholar who takes a G51 golf ball to somewhere in the world where Rudy will not be able to retrieve it and posts a video on YouTube will have their video placed on the hall of fame wall below!